Hernias are abnormal bulging of an organ or muscle tissue from a weak point in the muscle layer. It is now being with laparoscopic surgery that use minimally invasive procedures to cure hernia. This treatment has proved to be effective and safe. Also, the recovery time has shortened, and the post-operative period is not troubling to the patients. Diet: Diet has always played an important role in our overall wellbeing. After hernia surgery, special care is needed about diet. Due to the anesthesia provided during surgery, it becomes difficult to digest solid food, hence, consumption of liquids is recommended after a few days of surgery. The doctor will analyze the condition of a patient and allow the consumption of solid accordingly. Let the anesthetic effect go off: After surgery, the effect of anesthesia takes some time to decline and completely go off. Local anesthesia may take a few hours and complex anesthesia may take a few days for the effects to completely subside. Only after the anesthetic effect completely withdraws, the patient is recommended a discharge. Combat Headache: To avoid the risk of a headache because of anesthesia, a patient is compelled to lie down flat on their back. This is to be done for a few hours after the surgery. This process may feel quite uncomfortable at times. Bath: It’s advised not to take bath as it may cause the operated area to get wet. However, with due precautions, you can take bath after at least two days of the surgery. 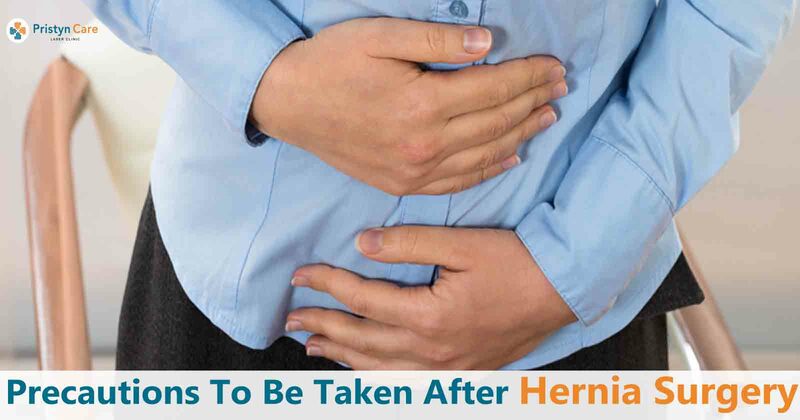 Taking care of these tips after the hernia surgery will help you with a fast recovery and prevent you from post-operative complications.